BikingToronto.com and Bikes Without Borders are proud to announce Tweed Ride Toronto, the most dashing and fashionable cycling event to hit Toronto streets in decades. 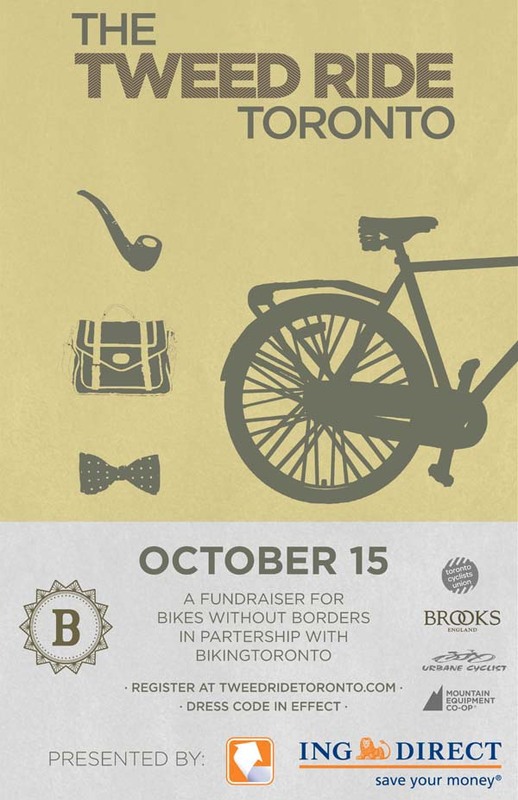 On Saturday October 15th, hundreds of participants will take part in the first annual Tweed Ride Toronto. Cyclists, dressed in their finest tweeds and old-time clothes, will leisurely take in some the city’s finest landmarks, break for high tea with renowned cycling co-operative Urbane Cyclist, and end the day with a jumping two-floor swinging party. Tweed Rides are a worldwide phenomenon, started in London in the fall of 2009 as “Tweed Run London.” This past year London registration sold out in seven minutes with more than 500 participants and celebrities such as Ewan MacGregor taking part. Similar rides have taken place in New York, Paris, Sydney, Tokyo and other locations. Any efforts made to recreate the spirit of a bygone era will be appreciated, and while all bicycles are acceptable, Penny Farthings are especially welcome. Prizes (including Brooks bags, Yakkay helmets, $500 ING savings accounts, Basil Baskets,etc.) will be awarded in several categories, including Most Distinguished Chap, Most Lovely Lady, and Most Awe-inspiring Moustache. Tickets are $15, and include ride, swag bag, high tea, snacks and party. Extremely cheap Big Wheel beer will be available! All funds raised will support Bikes Without Borders, a non-profit organization dedicated to using bikes and bike related solutions as a tool for development in marginalized communities. Participants are encouraged to do additional fundraising, and each participant who raises $1000 or more will receive a free Bobbin bike valued at $650! Raise $500 and receive a $100 Mountain Equipment Coop gift card. So much more!